Ready to breathe some life into your cycle of tired menus? This is the cookbook for you, or the book for that someone in your life who rules in the kitchen! 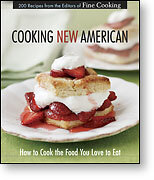 The "Cooking New American" cookbook, compiled by the editors of Fine Cooking Magazine (more) Sixteen fabulous parties are presented in this book. David Rosengarten shares menus, key ingredients, recipes, beverage suggestions, even room and table decoration ideas in this thorough party planning guide for a wide array of get-togethers.